Raised Garden Beds – What Are They? A Raised Garden Bed is an elevated garden bed that sits higher than the surrounding soil or the ground that it sits on, and is usually supported by some sort of frame or enclosure, though this is not always the case. The optimum size of a raised bed is 4 feet wide or less, at any length. The reason for a maximum width of 4 feet is a matter of ergonomics, this is the maximum width that a person can reach across to access the area efficiently from either side. They can be made to any length though it is more efficient to keep them reasonably short to save having to walk long distances around them constantly. I have found that 4’ x 8’ (1.2 x 2.4m) is an ideal length not only to work around, but to construct from 8’standard-length pieces of timber or railway sleepers if using these materials. The benefit of breaking up a long continuous 4’ wide bed into shorter sections is that of increasing the amount of “edge” available. To understand the benefit, I’ll need to introduce the permaculture concept of the “edge effect” – where two different environments meet, we have an “edge”, this interface between two different area creates a broader range of favourable environmental conditions or ecological niches, which support an increased variety of plants and animals, and are therefore more highly productive areas. If we now divide the same bed into 5 sections, we now have (5x2x4) + (5x2x20) = 240’ of edge. 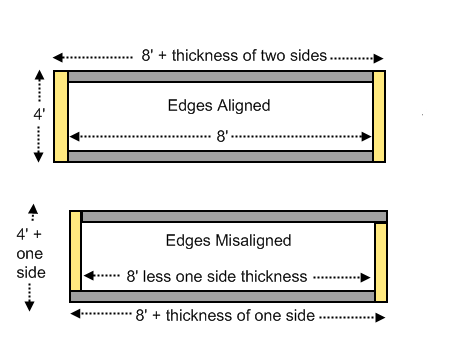 Through this simple change we now gain an additional 32’ of edge. The only thing to remember is that you will need an additional 32’ of edging material (if you are using edging material!) to build this, but rest assured that the benefit of increasing edge will outweigh the initial outlay in materials. What Are the Benefits of Using Raised Garden Beds? Increased Productivity According to Ohio State University, I quote, “In a traditional home garden, good management may yield about .6 pounds of vegetables per square foot. Records of production over three years in a raised bed at Dawes Arboretum near Newark, Ohio, indicate an average of 1.24 pounds per square foot, more than double the conventional yield.”Raised beds are more productive per square foot because plants can be spaced more closely together. This is because you don’t need to leave spaces to walk through, because you don’t need to ever step on the garden bed, ever. Having a higher density planting also has the advantage that the plants growing there will shade out bare soil, making it harder for weeds to grow there.There most important benefit of raised garden beds is productivity. Raised garden beds are at least twice as productive as a conventional garden. Better Soil Conditions Since there is no soil compaction, there is no need to plow, till, fork or dig the soil to loosen it up, traditional practices which destroy the soil structure and do more harm than good. Therefore, raised bed designs also lend themselves very well to the gardening technique of “no-dig gardening”.You can use raised garden beds to overcome issues of poor drainage, poor soil, or even no soil, such as gardening on top of straight concrete or asphalt, because you create the garden bed and fill it with the type of soil you require, and build it by adding organic matter. You could even create a number of beds with different soil blends for a variety of different growing environments.By not having to step on the soil, you avoid soil compaction. When soil is compacted, water and air do not move as easily through the soil to the roots of plants. Even the plant roots themselves have trouble growing through compacted soil, limiting the plant’s access to water and nutrients. It has been suggested that soil compaction can lead to a 50% loss in productivity. Increased Flexibility You can also attach trellises, supports, fences, frames, or shade cloth over/around the bed much more easily, or permanently as part of the structure.For people with physical limitations, such as those unable to bend over, or who are confined to a wheelchair, waist high raised beds are the answer. A bed of this height will enable the person to partake in their interest in gardening without hindrance.Not having to step in the garden bed has the benefit of being able to tend to the garden, that is, sow, plant and harvest, whenever you want, even when the ground is wet because you won’t be stepping in mud! More Efficient Irrigation Additionally, raised beds can support very thick layers of mulch above the soil, which will not slide off, or be blown or washed away. This not only aids in water conservation, but allows you to enrich and build the soil through the constant addition of organic matter.The dimensions of raised beds lend themselves to the installation of drip irrigation, which is an efficient way to water the garden, minimising loss by evaporation, and reducing disease by not wetting the plant’s leaves. Raised beds can be constructed from a variety of materials, and in many different heights, depending on your requirements. Basically, any materials can be used to create an enclosure of the height of your choosing to hold the soil. You can use recycled materials, new materials, man-made or natural, the choice is yours. Timber, bricks, concrete blocks, pavers, whatever takes your fancy. I’ll focus mainly on timber raised bed construction here, though I’ll cover a few other methods too. Traditional CCA treated pine (Copper Chrome Arsenate) contains arsenic, a poison which will leach into the soil and be taken up by plants, not to mention why it might do to your soil, which is a living ecosystem. It’s toxic when working with it, handling, drilling or cutting it. As is burning it. Having toxic chemicals in your soil is not the intent of organic gardening, nor is it in the interests of your health. Due to the arsenic scare, ACQ treated pine (Copper and Quaternary Ammonium Compound) is now being offered on the market. It’s touted as being a new, safer type of treated pine. That is, safer, this does not mean safe! There are a variety of timber treatments, all of them toxic. Treatments such as creosote (often used on old recycled railway sleepers) and other treatments such as LOSP (Light Organic Solvent Preservative) are all toxic. Using painted timber is not a safe practice either. Now that we have the health warning out the way, lets look at how we construct timber raised beds. 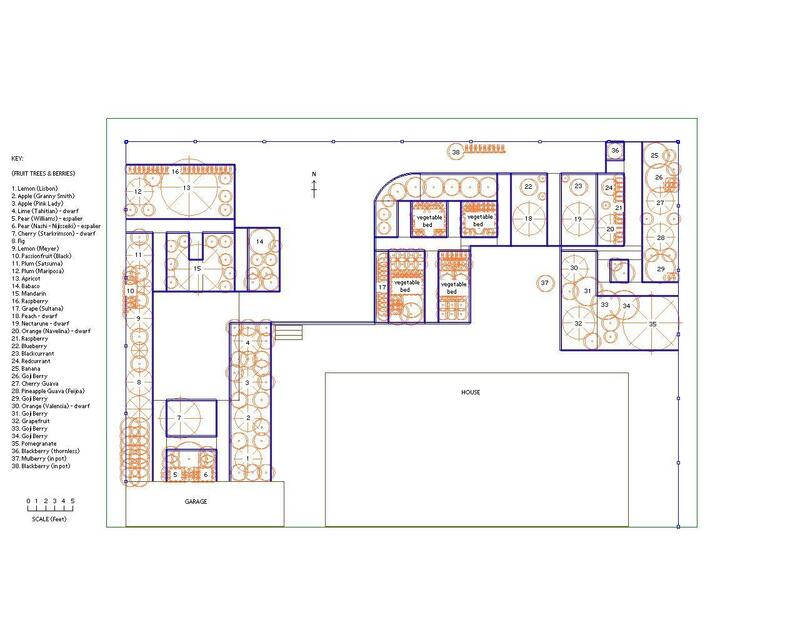 Before any construction begins, it’s best to draw out a plan or design with accurate measurements, as this will help avoid mistakes. Remember, building materials are not cheap, so use the old woodworkers maxim "measure twice, cut once" and avoid the wastage. Before we do any cutting or drilling, we need to determine where the wooden beams will be laid on the ground, and how long they need to be. This is important if the space is limited by obstructions, if you’re making an allowance for paths of a specific size, or if the beds are to match up the space you’ve allocated on a design or plan. The critical matter to consider here is that the thickness of the timber beams needs to be taken into consideration when determining the completed internal and external garden bed sizes. 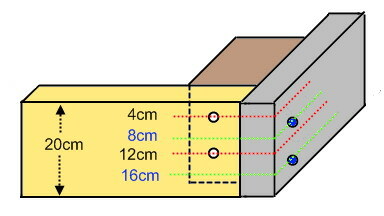 As is clearly visible in the diagram, the layout of the timber alters the overall dimensions. Decide whether the short or long sides will be the ones overlapping the ends, and stick with this when cutting and assembling, otherwise the final sizes of your beds either will be mismatched, or won’t fit where you intend to put them. One way of attaching the sides together is with a vertical post in each corner. It’s just a matter of marking where the holes go, drilling the holes, and fastening it all together with coach screws or coach bolts (they both have hexagonal heads so you can tighten them with a spanner or socket set). Make sure you use the right length. The coach screws should be long enough to go into the side and approximately 2/3 of the way into the corner post. Drill the pilot holes smaller than the thickness of the screws so they can bite into the wood, and drill only part of the way through the post, otherwise they won’t hold. Drill them too small and it will be hard work driving the screws in. Helpful tip: Rub beeswax (or a bar of soap if beeswax isn’t available) over the threads of the screw to lubricate them so it is easier to screw into the wood and prevents the both heads being sheared off. Drill a hole slightly larger than the bolt, and drill all the way through, then put a washer on the inside and screw on the nut and tighten using a spanner or socket on both sides. NOTE: It is important to realise that when fastening to a post, you will need to offset the positions of the fasteners otherwise they will hit each other! 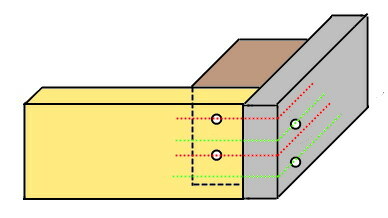 As shown in the diagram below, offset the position of the fasteners slightly higher on one piece of wood, and slightly lower on the other, so they are all spaced evenly apart. Since we need 4 holes evenly space from the edges and from each other, we need to divide our given width by 5. So, on the left hand piece of timber, we drill the first hole 4 cm from the top. For the next position, we can’t go down another 8cm position, because that’s where the other piece will be fastened, so we go down another 4cm again to the 12cm position from the top. So, the left hand piece is fastened at 4cm and 12 cm positions down from the top. Therefore, the right hand side piece must be fastened at the 8cm and 16cm positions down from the top. 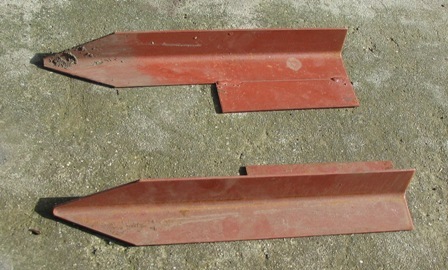 Another popular way is to fasten the sides together with steel brackets. 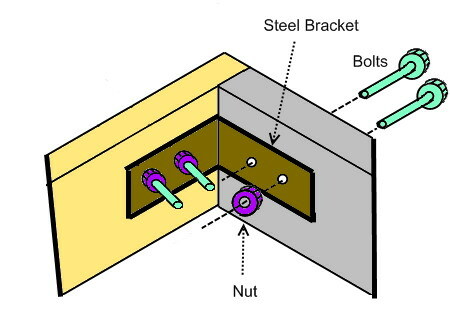 Shown below is a popular method of using a steel bracket on the inside of each corner, drill holes in the wood to match those on the bracket, and fasten using nuts and bolts. The heads obviously go on the outside, and the bolts extend into the inside of the bed, out of sight. Another popular type of steel bracket is one which has a stem coming off it perpendicular to the bracket, like a letter "T", with a pointed long section that is hammered into the ground. 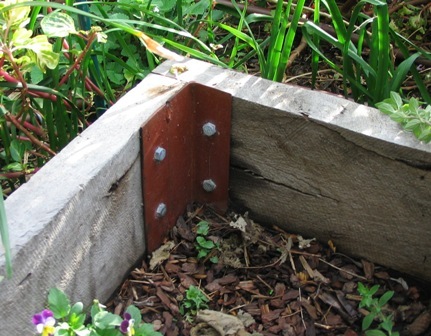 These can be attached either inside or outside of the raised bed structure, and fastened either with screws or bolts. The long pointed end sits firmly on the ground and stabilised the structure. This is particularly important when joining two sleepers end to end. Corner piece used on the inside of a corner – this bed is "L" shaped, remember, you can make beds any shape you wish! Extension piece joining two full length sleepers on a long garden bed. You can use a variety of materials to construct raised beds. If you can, recycle any materials before you go out and buy new stuff, it’s cheaper and more sustainable. Pavers make great edging material that lasts virtually forever, and this works great when edging up to a concrete path. In the picture below I’ve used rectangular pavers to create an edge along where the garden bed meets the concrete walkway. Rectangular pavers were used, buried lengthwise in a narrow trench dug with a small garden trowel of hand spade. To get good alignment, get some chalk and draw a line across them to indicate how far you bury one end into the ground. If it’s not exactly half way, draw an arrow pointing down on the bottom bit so you know which end is down. You can also put a wooden stake at each end, and stretch a piece of string across the top at the right height to get the tops level if the ground is uneven and can’t be used as a reference. You can hang a small builders line level on the string to make sure your string sits level if you have one. Thin timber strips, such as jarrah edging, makes fine and delicate garden edging for things like flower beds and paths. The timber strips are simply fastened with small steel "U" shaped clips, the ends goinhg into the ground. You can also use a mix of materials, as shown below, as long as it works. Below is a picture that shows where I’ve used an extra thick redgum sleeper, which separated the lawn from the garden bed above it. It is anchored by a steel bracket-stake op to where the concrete begins. This meets with the paver edging, which separated the garden bed above it from the concrete below. And in the top right hand corner you can see the jarah strips that define the edges of the 45cm wide paths which are mulched with pine bark mulch. You can even do composite bed material corners too! I encourage you to experiment, be creative and try out your ideas. That’s how I did mine! It’s quite satisfying when you succeed in making it all work too! OK, so you’re probably wondering if there’s a really cheap, no-cost way to do edging. Well thankfully, there is! It’s called Botanical Edging, the reason being, if you have something as large as a Botanical garden with thousands of beds, it’s not practical to install edging, so you just dig them. Botanical edging is the neat narrow trench you see around garden beds on large properties, estates and botanical gardens that seperates the beds from the lawns. The best tool to use is a half-moon lawn edger, which just looks like a crescent (half circle) with a long handle, as pictured below, but if you don’t have one of these amazing tools, you can just use a sharp spade (they’re the ones with the square end). The half-moon edger is wider and shallower than a garden spade, so you cut more edge done each time, and it’s set to the right depth, so you can push it all the way down. With a spade, you will need to control the depth of cut. Mark where you intend to cut the edge. 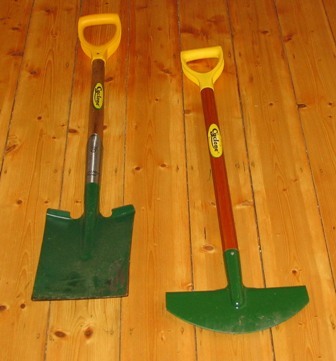 For a straight edge, cut against a plank of wood or a string line, for a curve use a garden hose or thick rope laid flat on the ground.Stand on the side of the path to do the digging, not in the garden bed.Push your half-moon edger or spade perfectly straight down into the ground. Step on one side of your edger, then the other so that you are using your body weight to drive it into the ground. 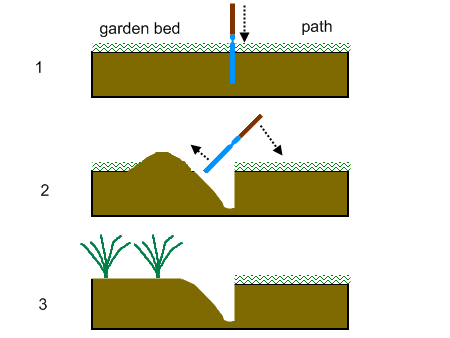 When the edging tool is all the way into the ground, or the spade is at the desired depth (put a mark on the spade to keep it consistent), lift it towards your garden bed to dig out the soil, and toss the soil onto the garden bed.You are aiming to create a clean vertical edge on on the path side, and a 45 degree angle on the garden bed side. The trench should be roughly around 6" wide x 6" deep (around 15cm x 15cm). Now you can go out there and build raised beds and enjoy the increased productivity of your garden! Another way to form a raised bed is by using old steel roofing sheets cut in half lengthways. The sharp edge is then folded over with a pair of pliers and these sheets are supported with steel rods on the outside. Once the compost , soil etc are on the inside, the sides stand solidly upright. It works really well but is not as aesthetically pleasing I grant you but a lot cheaper, if cost is an important factor. Another good read, thank you for all the hard work! Thanks Jan, that’s a great idea! Creosote, diesel, tar and a bunch of other toxic gear is found in old railway sleepers (as is noted in the article above) yet your garden beds featured seem to be constructed from this product (at least, that’s what the pic says). While those beds seem to be ornamental rather than edible, is there not ongoing soil health issues associated with the use of this type of product in gardens? Toxic products in the garden, heavens no! Definitely not here. 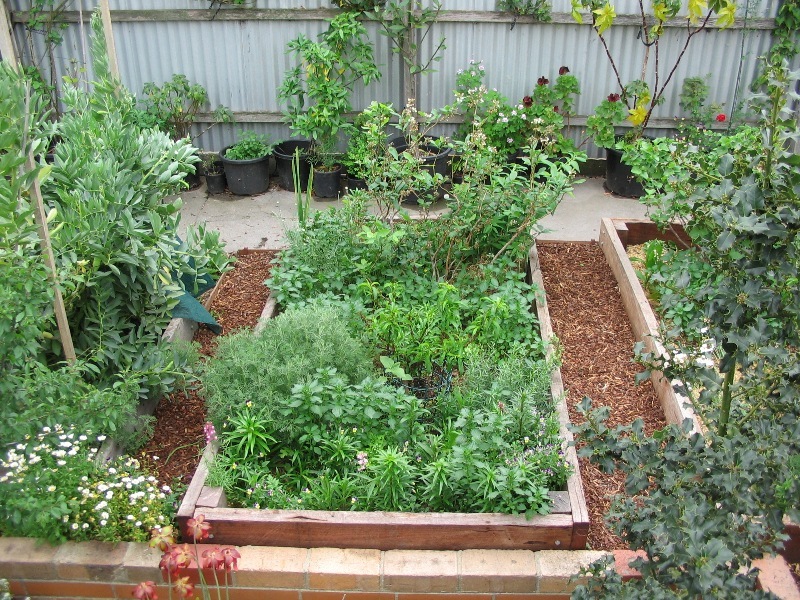 This an organic garden, the raised beds are constructed of NEW redgum sleepers, totally untreated, and not cheap either.. Thanks, I am happy to hear you say that the beds appear to be ornamental, actually, that suggests the garden must look aesthetically pleasing, I consider that a compliment. Yes, my garden does not have neat little rows of identical vegies in traditional monoculture style, which is just a pest insect banquet arrangement in real terms. In actual fact, it’s all edible, the rest is herbs and companion plants, there are a few ornamentals, but not in any significant numbers! This is what an overstacked, companion planted, food garden actually looks like. This is how nature grows plants, that’s how we do it in Permaculture. The farms have got it seriously wrong. If you want to know what’s in the beds, take a look at my initial design and the plant list I posted recently. As you rightly point out, there are issues with using treated timber in a food garden, or nay garden for that matter, the toxic timber treatments do affect soil health and do accumulate in the food grown in such soil, something best avoided! Best advice is to keep it natural! Hemp boards are a great idea! They are a renewable resource and sound very promising. Not sure of their suitability for outdoor structures, I honestly don’t know enough to comment about this application, but their suitability in the indoor applications is beyond question. They make an impressive composite wood, and when made with non toxic glues, can be used to replace chipboard, MDF and other wood composites, all of which use toxic formaldehyde based glues which out-gas toxic volatile compounds into the home. Hemp boards are stronger than these composites because hemp fibres are extremely long, much longer than short wood fibres. Hemp is also resistant to fire, fungus, rodents, and insects including termites. Thanks for raising awareness for such a fantastic material! I got a bit excited there, and went off the topic! Back to raised beds, here are a few thought. The nature of all things is that they are ultimately impermanent. Our modern society seems to think otherwise. Even treated timbers eventually break down and dump their toxic payload into the soil. Remember, when we practise soil building, we are building a vibrant living ecosystem, we encourage the organisms that break down and decompose both green and woody plant material, in order to create a nutrient rich humus filled with life. The organisms that make this possible, the fungi, bacteria, insects and other myriad lifeforms will not discriminate between dead timber. Most timber treatments work by killing these very same organisms. So you can imagine what they do to the soil. We can make wise choices to use the most sustainable materials available, ones with low embedded energy, and so forth. Ultimately it’s a trade-off or compromise of some sort. Recycled bricks make for an Earth-friendly solution, besser blocks or concrete will last for ages but are expensive, have high embedded energy, and concrete leaches lime into soil which some plants dislike. I prefer to use natural materials for a more natural feel, knowing the nature of such materials. There are many choices we have in how we build raised beds. Ultimately, it’s about making responsible decisions for what materials we choose to use. Another way to create raised garden beds cheaply – and minimum effort – is what my elderly (aged 88) uncle uses. Chicken wire formed into rounds (about a metre diameter), joined by twisting wires, and lined with black plastic, folded slightly over at the top. He then fills the interior with soil and compost which holds it all in place. If necessary he clips the plastic to the wire with pegs. He has several of these in the small backyard of the unit where he lives – and grows much of his own vegetables. Another advantage is that he doesn’t need to bend to tend his crops. It’s really a nice and helpful piece of information. I am satisfied that you shared this helpful information with us. Please stay us informed like this. Thank you for sharing. This is a very good article on raised beds. Another way to construct a raised bed is to use precast concrete boards (not Hardy Board) and mount them to pipes driven into the ground. The boards can be attached to the pipes with bolts that screw into concealed threaded inserts cast into the boards. The pipes can be used as inserts for poles or frames to tie tomatoes to or to provide a support for running plants. If anyone is interested, I will send pictures. 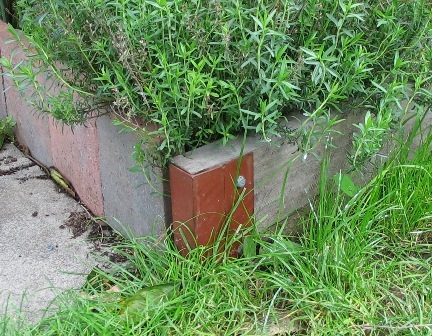 The concrete boards are a semi-permanent alternative that will provide a lifetime of gardening. These beds only need to built once. I have approximately $10 in each 4′ length of 12″ wide board. This includes the mounting hardware. I would be interested in knowing more about the concrete boards. I need to start building some raised beds, to move forward with what I hope to be an urban homestead. I used T nuts as the threaded inserts. I used 12″ masonry joint reinforcement at the midpoint of the 1.5″ thickness to strengthen the board. I used a piece of roofing as the bottom of my form. This added some detail to the exposed face. The smoother the form is made the slicker the concrete will be. The steel roofing leaves a very smooth exposed surface. It takes approximately 0.5 cubic feet of concrete mix for each 12″x4’x1.5″ board. The board weighs about 80 lbs. I did not see this weight as a problem, since they are not moved very often. Excellent detailed instructions and tips on raised beds. We use the same in our garden and couldn’t be happier. – You can get them in coloured concrete, similar to the colours that concrete pavers come in, although these can be difficult to source. Oh and I meant to say, I am so glad I just discovered your blog, it is fantastic! Good article. Your raised bed garden is beautiful! Just a note that the “benefits” of raised beds here have nothing intrinsic to raised beds. In fact, all of these benefits can be translated into well-designed “in ground” beds. Gardeners who do so also make gardens that are less resource-intensive, more sustainable and require less work than similar raised beds. I stopped using raised beds when I discovered that they required far more irrigation and fertilization than “in ground” beds with clever “in ground” water storage. Of course, one exception is Hugelkulture beds… mine seem to require little to no irrigation at all. Raised beds do dry faster than the surrounding ground. This can be a benefit if there are long rainy spells. I have had plants to “drown” and plants are more prone to disease if they stay wet for extended periods of time. web site is one thing that’s needed on the net, somebody with a bit of originality. useful job for bringing one thing new to the web! I am wondering about creating a pentagon or greater with fruit trees to train them and tie them together over a forum(?) as here in the high desert in Colorado it is tough to grow things out of the ground out of the wind or to get the fruit trees not to freeze in a late freeze. I love the veggie box ideas and plan to look at sizes of covering for moisture and such ideas? We get the 4 ft. concept but to extend the season up here may need to look at cover options for some of it fall. With the raised beds, you can easily construct covers for them. Some gardeners put metal pipes or short metal stakes into the soil inside the beds, and attach plastic pvc pipes/conduit to these supports and bend them into curved supports, over which they stretch greenhouse plastic or bird netting, depending on what they need the covering for. I live in Australia and found raised beds to cook in the summer heat. The wood on the sides heats up and the first foot of soil against it becomes too hot to even touch. As a result the water loss is extreme. For me I have found heavily mulched ground level beds to work best. Hi Jason, wood is a thermal insulator, the wood shouldn’t heat up and heat the soil. Soil should always have something covering it, wherever it is, raised beds or in the ground – in the heat of the summer the soil should be covered with a heavy mulch or with groundcover plants. 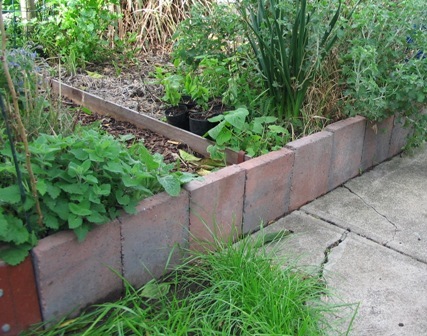 Raised beds have better drainage than the soil in the ground on account that they are raised. If the soil in a raised bed is not retaining moisture, add compost, this will help hold moisture in the soil. When using compost as a soil amendment, use one-third compost to two-thirds soil, this is the optimum amount to add, don’t add any more than this. A great idea for hot, dry areas are sunken beds instead of raised beds- if you have okay drainage. I’m currently building a mandala on a field next to my house. One thing I have a lot of are rocks, so I’m using them to create my keyhole paths into the circular beds. I was thinking of putting rocks on the perimeter of the beds to separate them from the main paths between the beds, but I’m just not sure- that’s how I ended up finding your site. I have an abundance of wood chips that will go in the paths, so they’ll go down- I’m just not sure how to separate them from the soil. Unfortunately, I didn’t allow for large rock size on the perimeter, so if I use them I’ll be taking away from either my paths or beds. I won’t be buying anything, that’s for sure. I tend to use what I have first. Good point, in arid (desert) areas, instead of being raised. garden beds can be sunken to lower the garden to where water is more easily accessible by plant roots, and more likely to retain water when it rains. You can use rocks for your garden border in a mandala design, but if the rock are way too big then you can use a few of them around each circular bed to define the shape, like the hour markings on a clock. If the rocks can be broken, you can smash then and use the pieces around the beds. One technique for wood chip paths is to dig out the paths and put the excess soil into the garden beds, then fill the trenches you have created with wood chips till they are level with the soil or a bit higher. As you walk on the paths the wood chips will compact and your paths will become level with the garden bed soil and wont spill over. The great thing with this method is that the wood chips eventually break down and create nutrient rich soil, so you can keep adding fresh wood chips and the earthworms will carry the nutrient rich material at the bottom that is well composted into the adjacent garden beds. Thanks, Angelo. Maybe I’ll break the rocks to get the size I need- great idea! All true about the wood chips- early in the year I spread them everywhere, even on my beds as a mulch. Now I have worms everywhere, and mushrooms too, which is a great sign the chips are doing exactly as hoped. There was some nitro loss initially- I wish I would have had some blood meal, but I wasn’t growing much this year anyway. This was a soil building year. Now if only I can find a great perennial vegetable sources for my zone 5. Back to the mandala. The soil here is awful, so I’ll be planting cover crops, which will also help define the beds pretty quickly I guess I’m a little concerned about the ease of turning then in if rocks are there. It’s really easy to convert an existing garden bed, see the second half of the article, hope this helps! So true about going up rather than digging down- this is how I’ve built all my new beds in the yard and have improved the existing ones too. This is how I’ve always done it. However, with the field I had huge rocks everywhere that had to be removed- after that there were giant holes everywhere. Knowing this and other things about the area I did some research and many permaculturists do till in certain situations- this field met that and so after getting the many and huge rocks out i tilled shallowly. To break up and level the soil before adding new. Next I’ll sow cover crops. I was referring to the cover crops being turned into the soil in the top few inches when I said turning- so you don’t turn them in you just build layer up from that? After they start growing well, and before they set seed, I considered just adding straw to the top, then going from there with more layers. I’ve added turnips to the mix for my cover crops so I’m not sure I’ll do that. Thanks for the clarification. Both with ‘green manures/living mulches’ which are chopped down to add organic matter, and with all my regular annual vegetables at the end of their season, I practice a technique called “chop & drop” – after the plants have been harvested, I chop them at the soil level, leaving the roots in the soil, and drop the above ground growth on the soil surface as mulch. I’ll chop the tops up into small pieces most times, either there and then with my secateurs by hand, or I’ll feed them through my electric mulcher. This system is a form of sheet composting, and the earthworms will dig down the composted material through the soil on their own, saves me digging it in! The roots rot down to create an incredibly intricate network of air channels which naturally aerate and decompact the soil, and allow water to infiltrate deep into the soil, which is why I don’t disturb the soil. Also, all the soil fungi (which are highly beneficial to plants) live mainly in the top 15cm (6″) of the soil, and get severely disrupted if you dig them up. This technique works for all plants except the brassicas (cabbage, cauliflower & broccoli family), because if you leave their roots in the soil, they produce plant growth inhibitors as they rot down – pull them up and compost them. I’m currently researching how best to approach some raised garden beds for food growing (the usual herbs and veggies). I’m weighing up going with untreated hardwood or the corrugated iron bed kits that are available. Would be interested to hear your thoughts re the metal kits – I would have thought they would be designed to avoid health risks? But to be fair, I don’t know enough to be sure at all! Where did you buy the spiked extension metal brackets? Been looking for something like that but can only find corner. Thanks! They’re quite easy to find here at landscaping supply outlets. Very informative post! I know this is an old thread, but I’m also looking for brackets like the ones you mention (spiked extension metal brackets) and I can’t seem to find them. Do you have a brand name? Thank you! 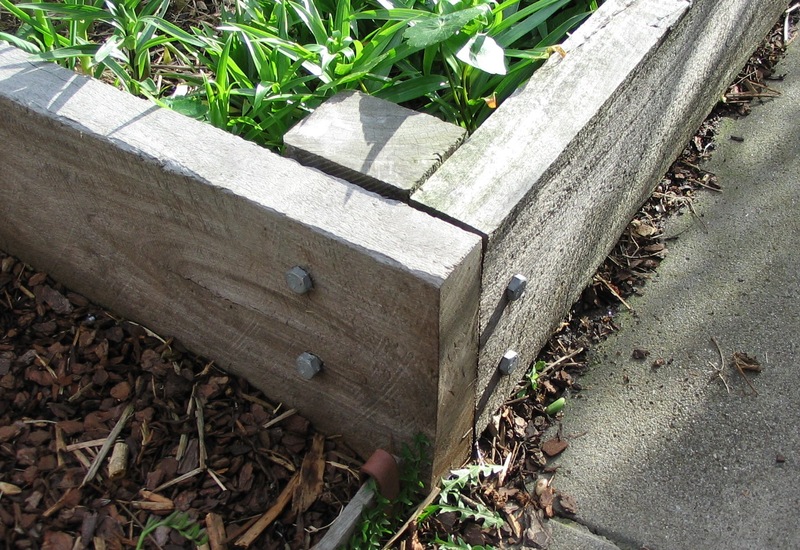 I get mine from a local landscaping supplies store, so if you check with any landscape supply stores they might have something similar for the purpose of securing railway sleeper garden edging. Can anyone recommend a material to use to divide up a raised bed, to allow crop rotation? Fibrous cement sheeting? There are a lot of materials you can use to divide a garden – timber or plastic garden edging, stones, bricks, or even paths. The paths can be dug out and filled with mulch, which will slowly break down and add organic matter to the soil. Thanks Angelo. It’s one big rectangular bed built with wooden edging, raised about 1m. Some of those options could work. When using sleepers do you suggest concrete in the posts? I use wooden posts because its very difficult to fasten the sleepers to the concrete. Wood can be screwed or bolted together. Don’t concrete them in, the raised beds definitely don’t move wherever you place them, and the advantage of not concreting the posts into the ground is that you can assemble them on a flat area of ground somewhere else and move them into place with a few people helping. Putting the short length internally so that it is 4 foot wide internal width gives more growing space. So better to do the full 4 foot internal width as long as you have reasonable reach. I find your website very helpful. I would like to build a raised bed garden approx. waist high for less bending, but I am wondering how one would apply the guilding principle in such a situation. Would planting a tree (trees) outside the raised bed be appropriate? Waist-high raised beds still need to be built at the optimum width for ergonomic access, it’s the same standing and bending over at waist height, no difference. You would definitely plant trees straight into the ground, there is no benefit in putting a tree in a raised bed as it limits the spread of its roots and raises the canopy beyond reach. The only viable reason would be to elevate it for better drainage but then you would really just mound the soil and plant into that instead. Hey there, great work but I have some food for thought…you have a no dig policy but from where and how does all that topsoil fill those beds? So if I understand you right, the soil content of your beds comes entirely from onsite mulch/compost etc? If you mean no-dig gardens in general, if they are not built on top of existing soil, then yes, all the material is brought in to build the beds as described in the articles. If you’re referring to my own garden, the no-dig beds are built on top of existing soil, and all green waste goes into the beds as a form of ‘sheet composing’ directly, or it goes into compost bins for and then it goes into the garden. Kitchen waste and food scraps go into either the worm farms or bokashi bins for processing then go into the garden. After trial and error I have changed the concrete beds to eliminate all hardware. I cast 1.5″x4’x18″ concrete boards. I dig a trench 6″ deep and set the boards on edge and backfill the trench. doing this anchors the boards and prevents grass from growing under the bottom edge. I have approximately $6 in each piece. A 4’x12′ bed cost $32 to construct. I cannot figure out how high the bed should be in the end. All layers add up to over 30 cm, but your railroad wood is only 20 cm. Can you clear this up, please? The bed can be as high as you like. Which layers are you referring to, the ones in the No-dig Garden Bed article? In the section “Converting Existing Gardens to No-Dig Gardens” I only have two layers and they all add up to 15cm. I was referring to the height of a note to garden on top of concrete. If the raised bed is built on top of concrete it will need to be at least 40cm (16″) deep to grow annual vegetables, and preferably deeper. I use 20cm deep raised beds to separate the garden from the paths and to hold the materials in place for the no-dig garden beds. What about curved or circular beds. They can be made out of corrugated iron curved around posts, pavers, bricks & mortar, concrete block, landscaping blocks specially designed for constructing curved beds, rendered earth bags, the choices are endless. 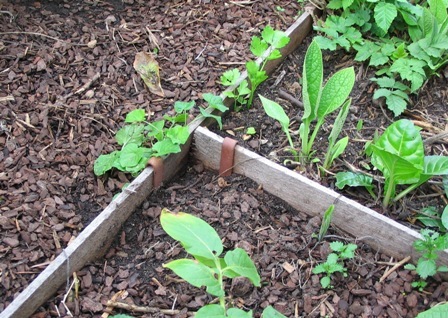 I have read conflicting information about using treated sleepers in creating raised beds. Unfortunately I have just constructed mine from this material and am now concerned for our health. Can you please refer any scientific references that actually document how these specific toxins (eg. arsenic) are taken up by the plants from the sleepers? And of course, how the plants actually retain these chemicals through their life cycle, since it is implied we will be consuming these toxins. Arsenic is a known human carcinogen and is acutely toxic at certain levels. When estimating the potential risks that a chemical may pose, one must consider two factors: toxicity and exposure. Toxicity is described as the harmful effects that the chemical may cause, which is often dependent on the amount or dose received. Exposure is the dose received, typically orally or through contact with the skin, or by inhaling, over a certain period of time. Thus, whether any risk exists is dependent on both toxicity and exposure. Arsenic is a naturally occurring chemical that can also occur in drinking water, food crops, and soil. There’s no two ways about it, it is poisonous stuff, and if there wasn’t a possible risk or danger, EPA would not have banned CCA. “Copper chrome arsenate (CCA) treated timber is wood that has been preserved with a combination of copper, chromium and arsenic. It is important to limit exposure to the chemicals that CCA timber contains. CCA treated timber is not permitted to be used in the construction of new garden furniture, picnic tables, exterior seating, children’s play equipment, patios, domestic decking and handrails. “Is there a risk that the CCA preservative can leak out of treated wood? It is possible that some of the preservative will be dislodged, depending on various factors such as wood species, treatment practices, age in service, and the environment in which the treated wood is installed. It is known that treated wood continually exposed to water in damp soil will lose more preservative than that exposed to an occasional rainfall. These factors are currently being re-assessed as part of the re-evaluation of CCA. Is it safe to continue to use CCA wood preservatives when a risk of exposure to arsenic and these other metals exists, especially when it comes to children’s exposure? Arsenic, chromium and copper occur naturally in the environment. Some studies have found that small amounts of arsenic, chromium and copper can dislodge from CCA-treated wood used in playground structures. When the U.S. EPA reviewed CCA wood preservatives during the 1980s it concluded that CCA-treated wood did not pose an unreasonable health risk. A similar assessment, conducted by the U.S. Consumer Product Safety Commission in1990 concluded that short- and long-term health effects are unlikely to occur for individuals coming into contact with treated wood. Health Canada critically reviewed these assessments and agreed with the overall conclusions at the time. Despite some questionable opinions which aim to downplay the risk, the fact is that arsenic and chromium are toxic, and copper in high concentrations is toxic to plants, everything breaks down in time, even treated wood, which can contain up to 10% by weight of CCA, which of course will end up in the soil eventually, resulting in toxic soil contamination. Plant do take up what’s in the soil, and certain plants can accumulate certain minerals at higher concentrations than the soil, hence the caution about growing root crops in lead contaminated soil (resulting from the stupidity of adding tetraethyl lead to petrol (gasoline for you Americans!) as an anti-knocking agent in previous decades and contaminating all the soil around roadways, with toxic lead, as well as the equally idiotic idea of using lead as a paint pigment, which contaminated the soil in the garden beds around homes). There are alternative treated timbers which are safe, those treated with CQA (copper quaternary ammonium) sold as “Eco wood” are suitable for this task. I do live in Australia (I have CCA wood) and now I’m faced with the decision of using this raised bed to grow vegetables or not. I am considering lining it with plastic in hopes that a physical barrier would reduce leaching into the vegetables? This seems logical to me, surely there would be significantly reduced contamination if there is a physical barrier. Otherwise I would not know what to do with this “toxic” wood. I am so disappointed as I was really hoping to grow some food in it. Thank you for sharing the info. Great page and great site! Thanks also for that important info on CCA treated materials. I’m in the process of building some raised beds out of cypress. My question, however, is about levelling the beds. Given the permaculture principles regarding the use of slope, should I be aiming for the beds to sit on the un-levelled earth, or should I excavate to get them level? The gradient I’m working with is actually pretty slight, but I thought I’d asked for a perspective. Hi David, it’s very easy to level a raised bed, to raise any side to level the bed up, you just push some soil under one side to elevate it and compact it down a bit so it stays put. If the soil doesn’t stay, a large stone or a bit of wood can prop the compacted soil up until you fill the raised bed with soil, then it then it will stay in place levelled. Raised beds water more uniformly if they are level. There are some new timber treatments where they blast the timber with copper nanoparticles. I read they are meant to be the safest treatment, but some people have expressed concern over the use of nanoparticles. I have built beds from cca sleepers but have lined them with plastic as they were wicking type beds. It certainly isn’t my first choice but acq treated sleepers are almost impossible to source in Townsville where I’m based. I generally use 25mm thick acq treated plantation pine planks, which I have to purchase in 160 length lots (150x25mm x 2.4m) as only cca treated plank are available locally and they have to be ordered in. Three planks high gives a bed height of 450mm for herbs and veggies and four planks high is 600mm which is deep enough for bananas and fruit trees. As I live in the dry tropics I line the bottom section of the beds with plastic and plumb them with socked dotted drainage pipe, with the drain 150mm off the ground. I fill with soil and have no gravel or sand layer like conventional wicking beds. To stop the saturated anaerobic soil at the base of the bed from going ‘off’ and creating methane I use an organic probiotic fertiliser made from food waste fermented with a modified EM (Effective Microorganisms) brew that replaces the methanogenensis microbiome with beneficial anaerobic bacteria, including purple non-sulphuric photosynthetic bacteria that utilises infrared light to sequester both nitrogen and carbon in the soil. The nitrogen is converted by other bacteria to become fertiliser for plants and the carbon improves soil structure. In this way these permaculture-designed BioWicked beds turn a problem into a high nutrient solution 🙂 As a side benefit the foof-waste-food cycle is carbon negative as more carbon is locked up in the beds than is released in the food waste fermentation. Incredibly helpful. I’m in NM, USA and have horrible granitic soil, takes an hour to dig 6inch hole for planting, in our foothill location. Going raised for veggies, and in ground for natives. Debating getting galvanized water troughs, drill holes for drainage, fill with soil compost mix. My debate is if the metal will cook, and if I would be better off with cinder blocks. High desert leads to large diurnal temp swings and very little rain (less than 10 inches per year). Thoughts? Thanks!!!! You can make removable decorative timber panels to cover the sides of the steel tanks if you don’t want them to heat up too much, but the tanks should be fine on their own as long as you water the plants. In Australia galvanised or coated (Colorbond) raised garden beds are popular, and our temperatures get fairly high, in Melbourne where I’m based our summers are hot and dry and temperatures are in the mid 30s to low forties (degrees Celsius) which translates to 95-108 degrees Fahrenheit, though we get 60cm (24″) of rain a year in our part of the country, but we still need to supply water to our gardens. Minimum path width is 45cm (18″), maximum width I would use is wide enough to fit a wheelbarrow if I was using a wheelbarrow to carry bulk materials around the garden. Now, if you have many people working on a garden bed all at once, such as in a community garden, then you need to allow space for two people to comfortably pass each other. Loved your article. Many thanks for the advice. To all who have or will be using cinder blocks or forms of concrete, please do some research as both may have “fly ash” in them. Fly ash has toxic properties. I’m currently designing by backyard food forest In Geelong and want to incorporate no-dig raised beds on top of my soil with Backyard Orchard Culture. I am designing my guilds with my fruit trees as the top layer in these beds, however I was a bit concerned about you mentioning to plant fruit trees in the ground instead. It looks like in your design you planted your fruit trees in beds – how did you manage to incorporate these two techniques (no dig and b’yard orch culture)? Hi Chris, the raised beds in my backyard food forest are a single 20cm high sleeper, they’re used more as edging to separate the paths from the no-dig garden beds that are built on top of the soil. They hold in the mulch and other materials in place in the no-dig system. Small trees are often planted in raised garden beds or large planters filled with soil. They can be converted to no-dig beds, that will work fine. I caution against planting trees in garden beds that filled only with no-dig materials because the soil level will drop when they’re first built and the materials begin breaking down, which isn’t a concern for annual vegetables. I am not using three of my beds this year they are 4 x 8 and 4 foot high. I have turned over my ground cover and put Compost on top and I’m wondering if I should put a tarp or something on top of that for the summer? You’d be better off planting a warm season green manure, you can get green manure seed mixes for warm and cool season, just sow the seeds, let the plants grow, then cut and dig the plants into the soil to rejuvenate it and replenish the nutrients.